Revisiting this maligned sequel after years, Freddy's Revenge would have made an excellent later sequel. The concept of Krueger needing a teenager fresh to Elm Street to possess in order to break into reality is refreshing. 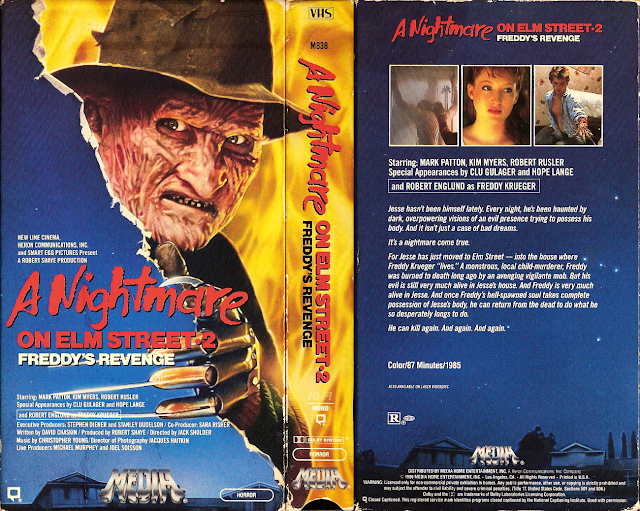 Kevin Yagher's Freddy burn make-up retains that raw fleshly pain seen in Craven's film instead of looking more like a mask as the series worn on. Even the near-total deviation from the original dream-based mythos is bold and interesting. The thing is considering all these aspects and this being the initial follow-up; its quite the disappointment. Although in hindsight of the series, this imperfect tangent of barely contained homoerotism and thrown lawn furniture is better than Freddy's increased stand-up stylings in the rest. MEDIA's tape isn't rare, but it is rarer than the early-'90s Video Treasures EP-speed version with the same cover art. I love this movie. Probably my favorite sequel of the series or at least tied with part 3.